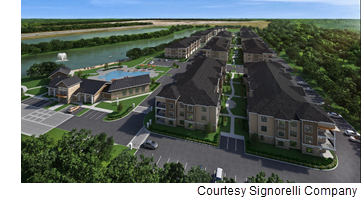 ​​​​ NEW CANEY – The Signorelli Company broke ground on a 456-unit multifamily development at the intersection of US 59 and the Grand Pkwy. Located within Valley Ranch Town Center, The Pointe ​will include one-, two-, and three-bedroom floor plans. The first 336 units are set to deliver in early 2019, and the remaining 120 units are expected to open mid-2019. The Pointe is the latest addition to Valley Ranch Town Center, where tenants include Toasted Yolk Cafe, Pizza Cucinova, and a Cinemark movie theater.